The girls have loved being back home and have been asking to do a lot of craft this week. Today I pulled out the old favourite — playing with pins — but added our collection of random beads to see what the girls would create. We started with our growing collection of polystyrene blocks. (I never throw away the styrofoam from anything anymore!) 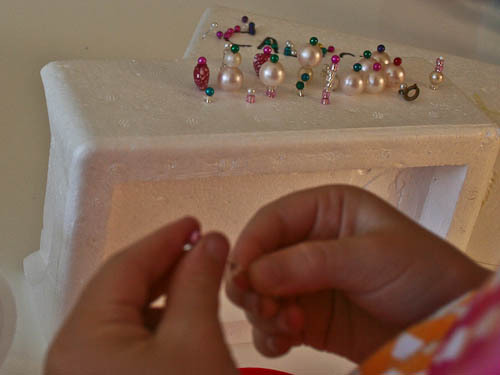 I have a collection of pearl-headed pins that I have bought specifically for sewing projects, but they live permanently in the girls’ craft cupboard. And then I brought out the beads. We used our collection of broken necklaces as a source for the beads — so pretty! 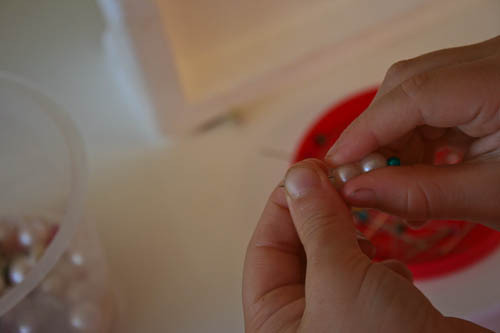 The girls carefully threaded the beads onto the pins. Aisha called her creation a "city" — this is her term for skyscrapers. I think it does look a futuristic city too! 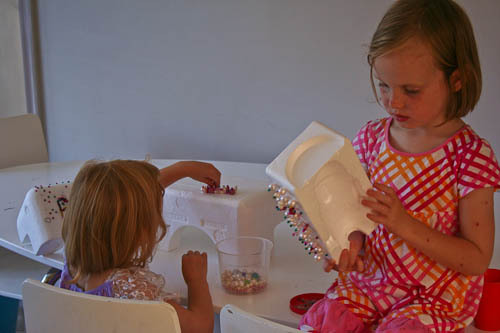 This activity keeps the girls busy and quiet for a long time — and it's pretty easy to clean up afterwards! If you haven’t yet tried this simple activity with your pre-schoolers, I’d highly recommend it. 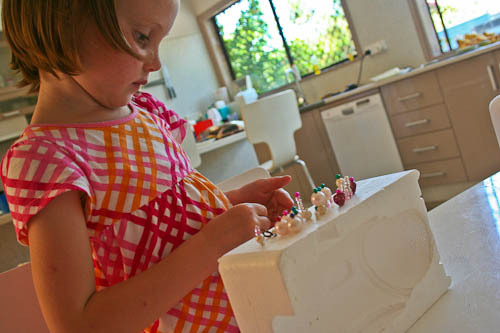 Of all the crafty things we could get up to, this is one of the simplest and yet the most engaging for my girls. What a fabulous idea. I can see my oldest being enthralled for a good long time doing that. Youngest has trouble sitting still for anything but she would enjoy seeing the end result of big sisters hard work. What I great idea! So simple and engaging—I can see that I might even want to do this even though I’m way older than your kids! The pin/bead creations looks so beautiful. We have used pins to make patterns in cushions and it is definitely a favourite activity of my sons.